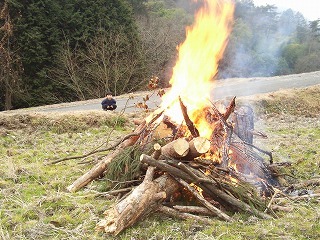 There are a lot of houses where the forest is owned, and open-air fire is done to the disposal of the miscellaneous trees that went out of the forest in the field in the farmer in the mountainous district. The replenishment of the disinfection of the soil of the disposal of miscellaneous trees and the field and the fertilizer is effective, and after open-air fire, farm products can seem to be done well. Miscellaneous trees is piled up in the field and it ignites it. This photograph piles up the branch with a useless tree of miscellaneous trees and the Japan cedar that went out of the hillback of my home in the under in a wide rice field and does open-air fire. In the hillback, there are a Japan cedar big sawtooth oak a lot of miscellaneous trees, pine, and tree and bamboo. It comes to get little sunshine if the tree grows thick too much. It is likely to embarrass it also with walking in the mountain. It used for the boiler for cooking for the use of these miscellaneous trees, and the bath had been burnt with firewood in old times. There were neither a kitchen range nor a bath where firewood was used, and these miscellaneous trees became obstructive now. A no potato of the utility value decided to be burnt in the field though miscellaneous trees that was able to plant the mushroom bacterium was able to be made tree of the mushroom. The soil is burnt when miscellaneous trees is burnt in the field and the bacillus dies out. Moreover, a remaining ash becomes a fertilizer. It is a similar idea to the jungle land cleared by burning. Neighbors seem also to be processing it in a rice field as wide as me. 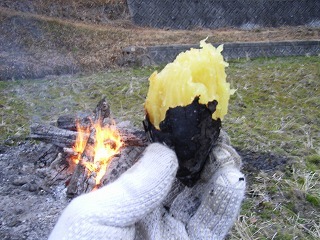 After open-air fire, the roast sweet potato is made. However, the roast sweet potato was made from the sweet potato afterwards because the fire was too good only to do open-air fire. A lot of roast sweet potatoes were able to be made easily only because of the radiant heat because it had strong caloric force. The surface is delicious burnt though it has scorched a little. It is possible to burn even if the potato is put in the ash when not burning because of the radiant heat. "Incineration of the branch it" is lawful though it seems to be a prohibition basic the open-air burning. Incinerate neither garbage nor waste. Open-air fire especially notes a fire because it will often do in winter, and air is dry in general. It is made the tan in there is little wind. There is no worry of flying sparks when burning at after it rains and drizzle. Because neither frost nor dew are dry when burning early in the morning, the possibility of flying sparks seems to be low. The thing of a combustible manmade fiber is avoided, and clothes are made the one of cotton. Open-air fire is not done alone for safety. Extinction is prepared as water is prepared in the bucket. It is possible to make it to compost making the chip from miscellaneous trees. Use with better miscellaneous trees is to break this miscellaneous trees in detail, to make to the chip, and to make it to compost. There is no worry of a fire, the utility value as the fertilizer is high, and I want to try this method in the future though a special machine that makes the chip is necessary, and not easy.